It has been reported that more than 30,000 parents in Australia have registered a ‘conscientious objection’ to having their children vaccinated, up from 4271 ‘conscientious objections’ in 1999. For parents in Australia wanting to avoid having their children vaccinated and wanting to avoid financial penalties, lodging an Immunization Exemption Conscientious Objection Form is the only means by which the federal government allows parents to make the decision to not have their children vaccinated. These figures support the claims made by the anti-vaccine movement and relevant lobby groups that Australian’s are waking up to the dangers of vaccines. Australia’s Government under the premiership of Julia Gillard [Labor] has adopted an extremist approach to childhood vaccination. Australian’s reactionary laws mean parents can be cut off from child care benefit payments if their children have not had all the mandated vaccines on time. 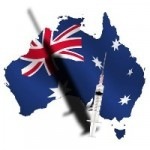 In Australia members of the military, students of mainstream medicine and employees at hospitals in the state of New South Wales, have no option but to accept vaccines or lose their jobs. Australia is now in the 5th year of a record-breaking whooping cough epidemic, and no doubt many parents are questioning why, if children are being vaccinated against this. Australia currently has more cases of whooping cough per capita than at any time since 1953 when the vaccine was introduced for mass use in Australia. Let me say that again another way. In 1952 when we had no mass vaccination for whooping cough, the incidence was lower than it is today with close to 95% of children vaccinated. It started with over 4,000 cases in 2007; 14,000 cases in 2008; 29,000 cases in 2009; 34,000 cases in 2010; and 38,000 cases in 2011. So obviously, there must be low vaccination rates, right? No wait…the vaccination coverage rates for infants under two is 94.9% and the under 5year rate is 90.7%. It certainly doesn’t seem like high vaccination rates equal, less whooping cough now does it? In a bow to reality, Australia also ended its free pertussis (whooping cough) vaccines for adults programme in May 2012. The idea of cocooning—protecting babies from diseases by vaccinating adults—simply hasn’t borne out. When they finally tried to find evidence in support of cocooning, it turned out not to be there. The concept of cocooning suggests that adults may infect babies before they are old enough to be vaccinated. 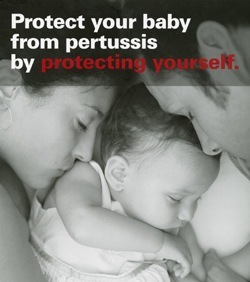 Therefore, if adults who come into contact with an infant are vaccinated, the infant won’t get the disease. The problem is that the concept of cocooning is an idea, not a fact. It hadn’t been tested. So Australians were a testing ground for the idea of cocooning. That is, the people were equivalent to lab rats—since 2009, they’ve been subjected to injected toxins to see if it might prevent whooping cough in babies. Whooping cough is rife in every country where vaccines are administered and vaccination rates have never been higher. So the medical community – which has long had a reputation for spinning a failure into a success – has decided that instead of blaming an obviously ineffective vaccine, they will blame those who haven’t been vaccinated for the occurrence of disease in the supposedly protected population. Only those who are not thinking would believe that sort of garbage and yet, the majority of the medical community and their pals in the media seem to fit that bill perfectly. If we look at the mortality rates in Australia pre-vaccine for most childhood diseases, you will see that there was already a 90-99% decline before most vaccines were introduced and the same decline in diseases like Typhoid and Scarlet Fever for which no vaccine was ever used in Australia. Typhoid fever (dotted line) was killing almost 80 per 100,000 head of population every 5 years in the early part of last century. 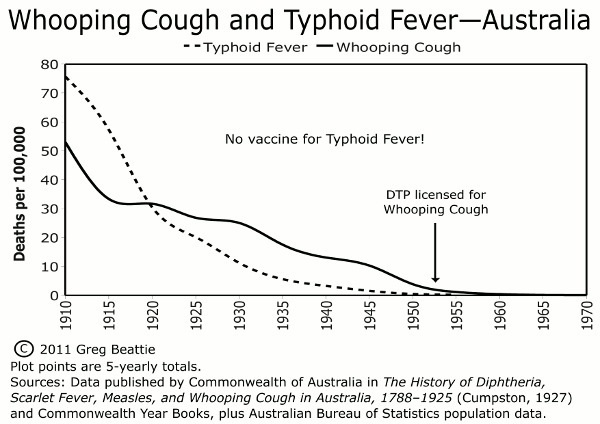 Without any vaccination whatsoever, deaths from typhoid declined in line with deaths from whooping cough. In fact, the decline in deaths from whooping cough seemed to plateau when we first started to use the vaccine while typhoid’s decline was steady and consistent throughout that period. Regardless of your interpretation of these differences, it seems obvious that vaccination had nothing to do with the decline in deaths from whooping cough and anyone who says they did is not basing their statement on facts or science. Dr. Russell Blaylock: Interview on Mandatory Vaccine Trials, Fraudulent Vaccine Science, and Vaccine Ethics. Listed below are links to blogs that reference this entry: Vaccine Myths Unravelling in Australia. This page contains a single entry by Toni published on December 10, 2012 10:35 AM. Northeast US Mumps Outbreak Involved 97% Vaccinated Children was the previous entry in this blog. 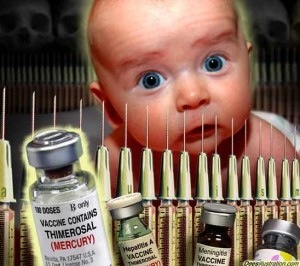 Vaccine Not Approved for Pregnancy Is Pushed on Pregnant Women is the next entry in this blog.